This volume of Notes in Mineralogy is one of the outcomes of a school in planetary mineralogy that was held in Glasgow, Scotland, in 2014. The school was inspired by the recent advances in our understanding of the nature and evolution of our Solar System that have come from the missions to study and sample asteroids and comets, and the very successful Mars orbiters and landers. At the same time our horizons have expanded greatly with the discovery of extrasolar protoplanetary disks, planets and planetary systems by space telescopes. The continued success of such telescopic and robotic exploration requires a supply of highly skilled people and so one of the goals of the Glasgow school was to help build a community of early-career planetary scientists and space engineers. The book provides an overview of the state of the art in planetary mineralogy, and one theme that runs through the chapters is the range of extraterrestrial materials that are currently available for analysis. The most important samples are meteorites, including those from the Moon and Mars (Chapters 5, 6), and pieces of primitive asteroids that are represented by the chondrites (Chapters 1,2,3). However, very valuable information on Solar System processes can also be obtained by analysis of micrometeorites recovered from the Earth's surface and interplanetary dust particles collected from the stratosphere (Chapter 9), and by studying materials formed by the impact of meteorites with our planet (Chapters 4, 8). In some ways, however, the most important extraterrestrial materials are those whose provenance is known precisely. They include samples that have been returned from the moon (Chapter 5), and grains that were collected from comet 81P /Wild and asteroid Itokawa by the Stardust and Hayabusa missions, respectively (Chapter 3). The chapters also highlight the wide range of sophisticated analytical instruments and techniques that are available for analysis of these extraterrestrial samples. 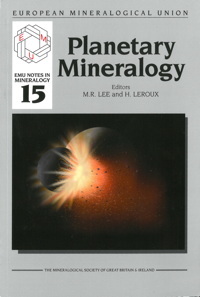 As underscored by their inclusion in all parts of the book, and in particular Chapters 6 and 7, stable and radiogenic isotope systems are a fundamental tool for probing the sources of the inorganic and organic constituents of the protoplanetary disc, the timescales of parent-body evolution and accretion, and the history of planetary surfaces and interiors. The NanoSIMS technique has been an especially important driver of cosmochemistry research, as highlighted in Chapters 2 and 7. Conventional petrographic techniques remain an important means of studying meteorites and impactites (Chapters 1, 3, 4, 5, 8, 9), and are particularly powerful when used in combination with high-resolution electron microscopy (Chapters 2, 3, 9). Each of the chapters explains how these analytical techniques have been applied to various suites of extraterrestrial materials in order to explore and understand the evolution of the Solar System. Chapter 1 describes its earliest history, as revealed by the mineralogical, chemical and isotopic properties of the oldest preserved solids, the calcium- and aluminium-rich inclusions and chondrules. These cosmic 'sand grains' have been used to understand the composition and dynamics of the proto planetary disc and accretion of planetesimals, but the chapter also highlights the controversies and debates surrounding the earliest stage of planetary evolution. The organic matter within primitive meteorites, micrometeorites and interplanetary dust particles can also be used with great effect to explore the Solar System history (Chapter 2). These organics allow us to look back at the nature of the progenitor interstellar cloud, the properties of the protoplanetary disc, and can also reveal processes that took place in the parent bodies of primitive meteorites. Parent body evolution is the focus of Chapter 3, and includes discussions of compaction, aqueous alteration and heating, and highlights the potentially very important role of collisions between asteroids in catalysing these processes. The physics of impacts and their effects on rocky targets are discussed in Chapter 8, and various criteria that can be used to identify past impacts on Earth are described on both Chapters 4 and 8; both of these chapters also draw attention to the importance of modelling and laboratory experiments for understanding hypervelocity collisions. The Moon and its pockmarked surface provides the most obvious and vivid record of the role of impacts in planetary evolution (Chapter 5). With the resurgence of interest in lunar exploration, our only natural satellite has the potential to reveal much more about the drivers and timescales of Solar System development, and may also provide the stepping off point for future manned exploration. (2015) xii + 301 pp. ISBN 978-0903056-55-7.